This is an amazingly beautiful sink! The quality seemed unbelievable however as soon as we removed it from the box, we believed, lol! Seriously it is a really beautiful sink. We wanted a sink with deep separate basins and this one is great. The sleek design is gorgeous. The slenderness of the center divider is great and very sturdy. We are very pleased with this purchase and would highly recommend. The sink grids and other accessories are of very high quality as well. We are not disappointed! Dimensions 33.0 In. X 22.0 In. X 10.0 In. I almost returned this item because it did not fit into my existing sink hole. ( whomever did that before us, didn't follow the codes). We had to cut out 2" of my granite countertop and we were able to slide it in. I love the look and functionality of this sink. It is very well made, heavy and quiet. It came spotless in the box securely wrapped, it almost looked like a huge piece of jewelry. The inside of this sink is much bigger than other standard 33X22 sinks due to its very narrow outside frame and slim middle divider making the compartments wide and long. The shorter middle divider is a plus and makes it easier to wash large items. The grids and drain make this sink look very elegant and expensive. The reason for only 4 starts is the fact that the water doesn't drain completely. It is not that there is standing water on the whole bottom of the sink but there is water standing in few places. I checked my cabinet and the sink itself before installation to make sure they were leveled and they were, so I guess there is a flaw in the design. You really can't tell until the sink if fully installed and plumbing attached. I would hate to dissemble it and return it. This is an excellent sink. Very high quality and great attention to detail. It is very spacious and deep giving plenty of room to wash large dishes like crock pots. The low divider allows for you to wash pans lower in the sink and avoid splash back. The metal is nice and thick with huge sound deadening pads on all sides and an all over coating providing additional sound deadening. Because of this, it sounds and feels much more solid than any other metal sink I have used. This keeps the loud banging you typically get with metal sinks to a minimum. The steel on the top edge is very thick and solid, but it also has a nice angled bevel that allows you to easily wipe water and debris into the sinks. 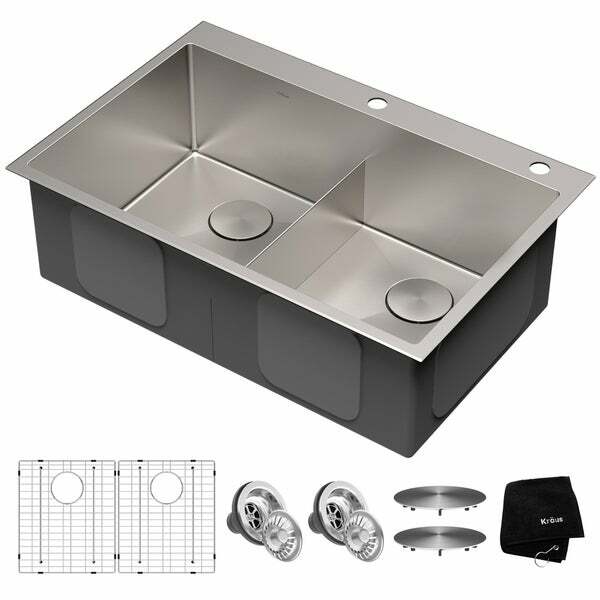 In addition to the high quality, it is great that this sink also comes with all the accessories like the grids for the bottom of the basins, the drains, plugs, and even drain caps. The caps that go over the drains give it an even cleaner, high quality look. The only minor negative I found was that the drain body is plastic. It is very thick and solid, so I don't forsee any problems, unless you possibly miss-thread it during installation. Other than that very minor detail, it is a top quality sink that hits way above it's low/mid price range. I couldn't be happier with this sink. Received many compliments for this sink. It is very deep and very big. Loved the low divider. Also it makes the whole kitchen look much more modern. Would definitely recommend anyone to purchase this. This sink is beautiful. I love the low divide. I have not been able to install it yet because I am waiting on the counter top. Can’t wait to see the finished product. The sink was delivered quickly and the packaging was adequate to protect the sink during shipping. This is a very high quality solid sink. It has a very nice finish and does not stain. I have purchased Kraus sinks in the past for our rental condos and am never disappointed with the quality. I needed a drop in for this project and the edge gives a very professional look. This is a solid heavy sink. There is no need to worry about corner damage, they are strong and sturdy. The sink is gorgeous and we are very pleased with it. I like having the center low enough to get the big pots and cookie sheets in without getting water all over the place. Happy with purchase! Love, live, love Kraus sinks. Well made, gereat noise reduction, variety of sizes, and stylish. Just beautiful! Contractor loves installing them too boot. Beautiful sink, absolutely love it! I am impressed with the packaging. The sink itself looks amazing and really nice. I am just giving four stars out of five just because I still need to install it. 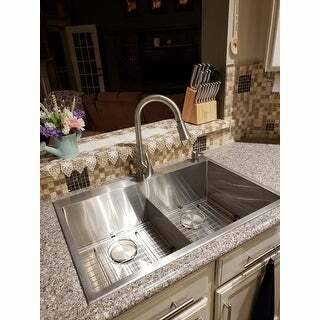 This sink was chosen by my wife and I have some doubts about the dividing between the two sinks lower than usual, I just hope it will be practical when I am cleaning dishes. I also hope cleaning the sink itself would be easy, those 90 degrees corner give me some thoughts. As I said, as aesthetics and building quality is really impressive. Please, forgive my English as a second language. The sink has 10 inch deep bowls and a soap dispenser and will fit my existing opening.